Germany’s ‘Oktoberfest’ is one of the most famous events in the world attracting around 6 million people each year from all over the world to celebrate it. It takes place in Munich in Bavaria and is a celebration of Bavarian culture, particularly its beer although it has far more to offer than just being renowned for being the world’s largest beer festival. Despite referring to the month of October in its title, the vast majority of Oktoberfest actually takes place towards the end of September. Traditionally, it runs for sixteen days up to and including the first week of October. However, depending on when the first Sunday falls in October, it can last 17 or 18 days. This year (2008), it runs from 20th September to 5th October. Oktoberfestbiers (the beers) are supplied each year by 6 breweries, known as the ‘Big Six’. They are Spaten, Löwenbrau, Augustiner, Paulaner, Hofbräu and Hacker-Pschorr. Wine is also served. Beer is served in the traditional German stein tankards which hold a litre of beer and each of them will have the logo of one of the ‘Big Six’ on them which makes them collectable souvenirs. Prices for a litre of beer in 2008 are around 8 Euros. Visitors also celebrate by eating a wide range of traditional Bavarian food and snacks including sausage, käsesspätzle (which are cheese noodles), hendl (chicken) and sauerkraut as well as Äpfelpfannenkuchen (apple pancakes). A traditional Bavarian delicacy are roast ox tails, popular with both Germans and international visitors alike. Oktoberfest is like a village which consists of 14 tents all with something completely different to offer and each tent will feature beers exclusive to one of the ‘Big Six’ breweries. The tents vary in size catering for people both inside and outside the tent although not all cater for outside guests. These tents are massive and some can hold in excess of 8000 to 10000 people. Whilst many people come for the beer, Oktoberfest is about far more than just eating and drinking. Before it even opens, it all begins with a procession featuring around 1,000 participants, including the landlords’ families who are transported on horse drawn drays in the old traditions of the breweries which have all been decorated. The bands which will play in all of the beer tents also take part in this procession. On the first Sunday of Oktoberfest, there is a Costume and Rifleman’s procession which gives you a magnificent insight into the customs and traditions which lie at the root of Bavaria. You’ll witness Bavarian dancers dressed in traditional costume, trumpeters riding on horseback, flag throwers and a host of other colourful performers who come to celebrate. 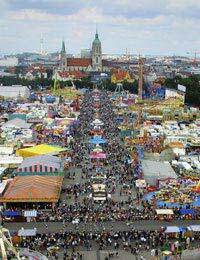 Then on the second Sunday, there is a large open-air concert of all the Oktoberfest bands in which in excess of 400 musicians take part. There are also plenty of rollercoaster rides to enjoy. Oktoberfest truly is a magical festival for young and old alike to celebrate but it gets extremely busy with hotels in and around the Munich area being booked out well before the festival starts. Reservations for the tents are not required unless you want a table. To find out more information, you should visit both the Munich and Oktoberfest’s official websites.